For one, the president has arrived at two pieces of market-opening negotiation: the U.S.-Mexico-Canada Agreement (USMCA) and an agreement with the European Union. The USMCA, if approved by the U.S. Congress, compels Canada to open its dairy market, which is surrounded by a wall of protectionism, and makes important strides toward updating NAFTA for a digital age. In addition, the agreement "includes some protection for Canada and Mexico from Trump’s threats to impose tariffs on auto imports," per the Financial Post. Reflecting on his success in obtaining the new arrangement, the president said, "Without tariffs, we wouldn’t be talking about a deal — just for those babies out there that talk about tariffs." This comment demonstrates that Trump saw his steel tariffs as a tool in the pursuit of a broader, market-based agreement to replace the North American Free Trade Agreement (NAFTA), which he regularly chides. If the president truly intended a longstanding national policy of protection, he would have not used tariffs as a negotiating tactic to obtain a pro-free market deal that actually limited his ability to institute future tariffs. Using the threat of automobile tariffs, the president has also come to an agreement with the European Union. They agreed to buy more U.S. soybeans and natural gas, an improvement from the current status quo: a heavily-subsidized, walled-off agricultural industry and a reliance on Russian gas. Kudos to the president for opening up European markets to American competition. 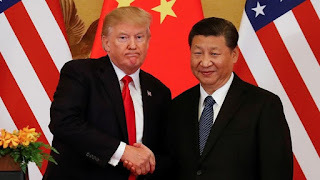 Secondly, the president has obtained real concessions from China, who he backed into a corner with billions in tariffs and the promise of billions more. The Chinese have agreed to lower their automobile tariff, purchase more American agricultural and energy products, and open their doors to foreign companies. Days ago, the Chinese began the execution of their purchase commitments by buying 1.5 million tons of soybeans from the U.S.
And according to The Wall Street Journal, China plans to rewrite Made in China 2025 and "play down [their] bid to dominate manufacturing and be more open to participation by foreign companies, [sources] said." If the Chinese were to scrap their Made in China 2025 policies, the results would be tremendous: more access to their markets for foreign countries and fewer of the implicit unfairnesses spurred by the Chinese government's financial support for Chinese enterprises. At that point, it would be disingenuous to say that Trump's policies have distorted the free market. Even The New York Times, a reliable foe of the president and his agenda, understands. They published a piece titled, "Trump’s Strong-Arming of China Might Be Working." What does this all mean? Global trade agreements can be vague and uninteresting on their face. Ultimately that's what you want, you want tariff free, no barriers, and you want no subsides because you have some countries subsidizing industries and that's not fair. So you go tariff free, you go barrier free, you go subsidy free, that's the way you learned at the Wharton School of Finance. Trump's tariffs, which have been the genesis for extensive negotiations and compromise, appear to be a tool in his pursuit of no tariffs, no barriers, and no state support of domestic industry. What remains to be seen is whether the tariffs lead to tangible results with the Chinese and a formal agreement with the Europeans. Will they open up their markets to the extent that they have promised, or will they make empty vows that they refuse to keep? Additionally, although the president's tariffs appear to be a negotiation chip, he retains the illusory view that protectionism is good for American industry. I encourage Trump -- who has removed regulations on enterprise and lowered taxes -- to remain committed to the divine power of the market, unimpeded by the hand of the state. This will coincidentally allow the Dow Jones Industrial Average, the president's favorite scorecard, to hit the 30,000 mark.